The beagle gets walked three times a day. By far, her most exciting walk is the one she has with G each morning at around 5.45. He takes her out of the compound and walks her around the local neighborhood. Occasionally a little traveller joins him, not me – I’m taking every extra minute of sleep I possibly can. I often wonder what goes through the beagle’s mind when she sniffs amongst the rubble and the sand. Does she pine for the greenery, asking her expat beagle self “Why am I here?” In Houston I walked her along the bayou each day, she loved it. Without fail there was a swampy bit of grass to roll in or another dog to face off with. The beagle is full of false bravado, she’s one of those dogs who barks like a madwomen when she’s on the leash, if she escapes and finds herself leashless she’s suddenly a little less confident. “Muuuuuuuuum” she was terrified. She immediately dropped the leash. It was a stray dog, a Saluki. Salukis have a similar appearance to greyhounds and can run at about the same speed. There was a growl and then a whack as the dog ploughed straight into the beagle, it bounced, turned and growled again. The girls gathered behind me “Muuuuuuuuuum”. In an instant I saw their two different personalities, as scared as the second traveller was, she understood me when I told her not to run. 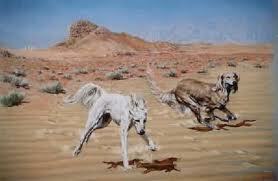 The first traveller grabbed my arm, the second traveller stared the Saluki down. “Stand your ground, don’t let it know you’re frightened. DO NOT RUN. We’re going to casually turn and walk back to the compound. Stay tough, make noise, tell it to GO AWAY”. I pretended I knew what I was doing, I pretended I was on top of the situation. I started telling them a story about Granny Max, how amazing she was when the Pit Bull Terrior came to eat our Labrador, how Granny had dragged our dog inside while the Pit Bull had locked on to the Labradors neck, Granny refused to let go. If Granny were here, she’d stand her ground, stay firm. This is what we have to do girls. Be like Granny, that dog is not going to hurt us. Meanwhile, the usually barking beagle had not said a word. Her head was down, nose to the ground, her eyes were saying “Get me out of here now, I don’t care if you have to pick me up and run, just get me out!”. We began walking, we kept talking, my voice stayed in a monotone. There was more barking, more growling, and then we realized there was another dog. “Keep walking girls, let them know you’re in charge”. I didn’t recognize my voice for a moment, and then I realized I’d borrowed it from the Boarding House Mistress. Keep calm, carry on. When we made it to the compound walls there was a definitely feeling of relief. We high-fived our tremendous courage and decided we were going to head back to the trenches the following day. Nothing could stop us now. We arrived home to discover the boys had been on their own adventure. They’d decided a cup of tea was in order, as you do when you’re 6 and 9, and had managed to locate the real tea, obviously a tea bag wasn’t going to do the job. There had been considerable spillage. The floor looked like a welders workshop. They were sitting side by side, teacups in hand, enjoying their culinary brilliance. Mr 6 was in charge of the toast, he’d turned the toaster up to charred black and they were crunching their way through the vegemite. The banter between the two groups was hysterical. “We fought off a stray dog” said the girls. “Well, we made tea!” said the boys. When we got into the car to head to school the usual conversation regarding what to listen to ensued. Music, podcasts, we decided on This American Life – a story about Harper High School in Chicago. “My hand is still shaking” I said to the first little traveller as I placed my purse in the console. The story began. We listened to the sound of the High School Principal addressing the school at assembly. She asked for a minute’s silence to remember three students who had died. They’d all been shot. Last year there were 29 shot, 8 of them died. All of this happened in the local neighborhood. In the ten minutes it took to drive to school we heard of students who were frightened to walk to school, of the tactics they employed to stay safe. One boy told how it’s better to just drop to the ground and pretend you’re dead. I caught the faces of the little travellers as we drove. It was a look of confusion. How could this be? In Chicago there were 506 dead last year. As the car pulled up to the school gates we all acknowledged how lucky we were to live somewhere safe. We were so lucky that dog didn’t have a gun.